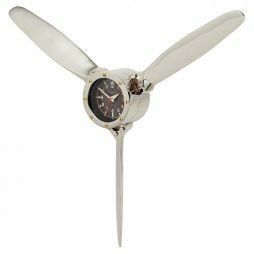 This Howard Miller Brassworks II Wall Clock from Clockshops is the perfect accessory for you. 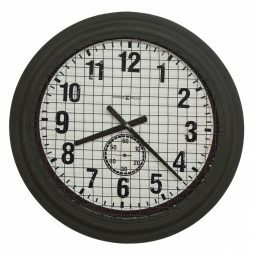 It is an over-sized, large wall clock showcases a distressed red dial with metal outer frame finished in antique black with brass undertones and highlights. 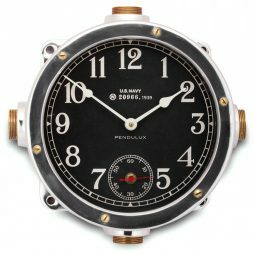 The dial features aged iron-finished gears viewed through an open center. 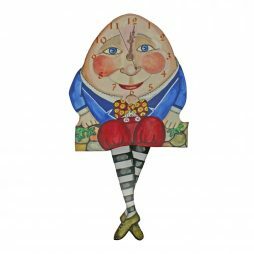 Steeped in quality and value, this Howard Miller Grange Hall decorative wall clock is a perfect accessory to adorn your home. 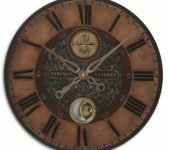 This unique 27 1/2 inch wall clock features an aged background with multi-colored panels within an all metal frame. Each panel has been exclusively printed with Arabic numerals and its own background color and distressing to look aged. 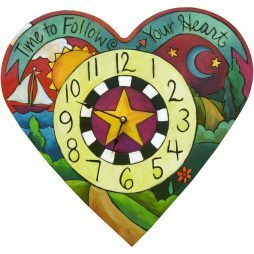 The middle section of this large wall clock is open to let the color of your wall be seen in the center. The spade-shaped hour and minute hands are finished in aged black. Quartz battery-operated movement needs one AA battery. 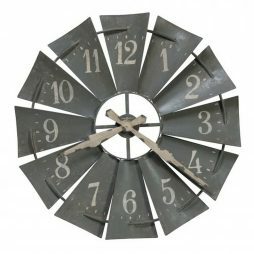 This is a unique distressed wall clock with a modern, shabby chic design. 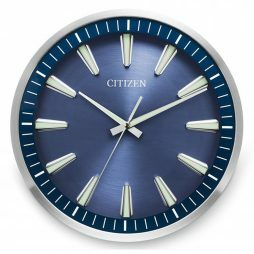 This wall clock has a beautiful age blue color that will brighten up any room. It also has wood panels with a distressed mahogany frame. 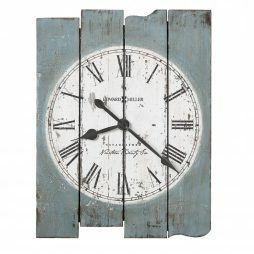 This distressed wall clock is made from various materials such as wood, medium-density fibreboard (MDF) and metal. It also has quartz movement as well. 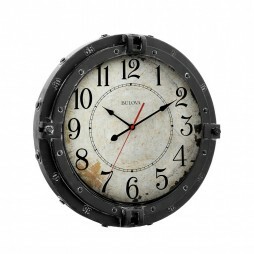 This wall clock will go great with any shabby chic or rustic interior. It will also add a pop of color to any room because of it’s alluring blue color. 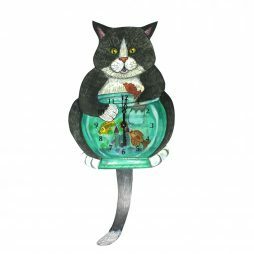 This is a whimsical and fun wall clock that is guaranteed to add a modern touch to your home or office. 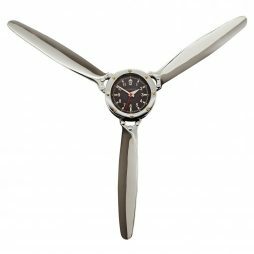 The Max Aged wall clock has a unique design that is captivating to the eyes. This wall clock has a rust brown wire caged. 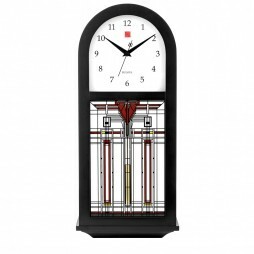 It also has an aged ivory face that compliments the clock’s red accents. The materials that made this clock include metal and medium-density fibreboard (MDF). 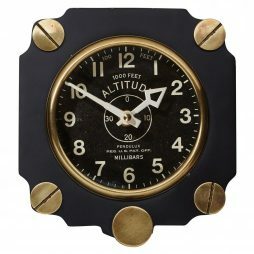 This unique wall clock also has quartz movement as well. 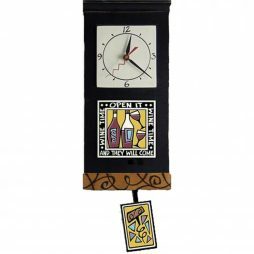 This unique wall clock has a nice eccentric design that will go great with any contemporary interior. 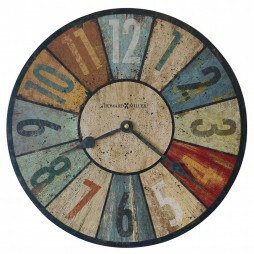 Bring a rustic charm to your home or office when you add this wall clock. 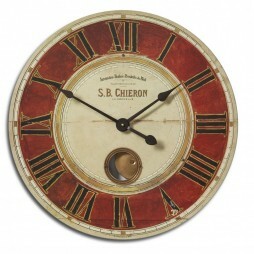 The S.B Chieron wall clock is a decorative wall clock that will fit with any type of dcor. 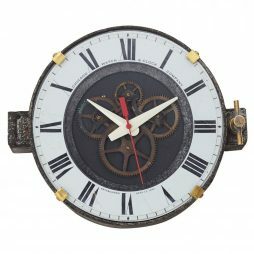 This timepiece has a weathered laminated clock face with cast brass details. It also has an internal pendulum. 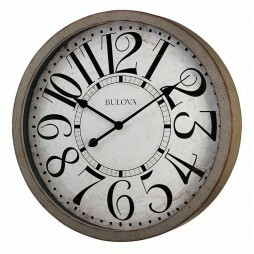 The clock is made from materials such as Medium-density fiberboard (MDF),brass, and aluminum. 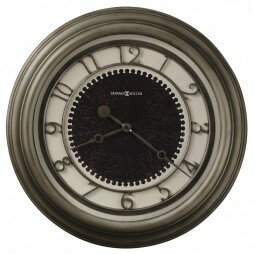 It also has a nice brown finish that completes the overall look of this stunning wall clock. 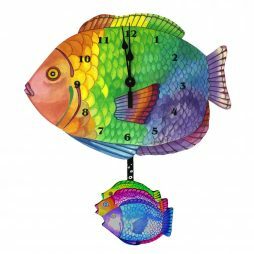 This wall clock is visually appealing and truly a work of art. 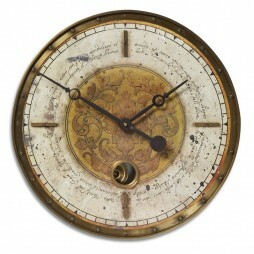 The Leonardo Script wall clock has a beautiful design that will accentuate the beauty of the walls of your home. 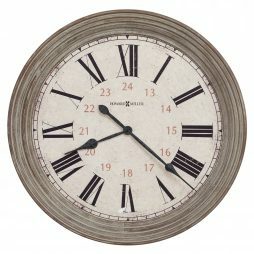 This cream wall clock has a weathered, laminated clock face. 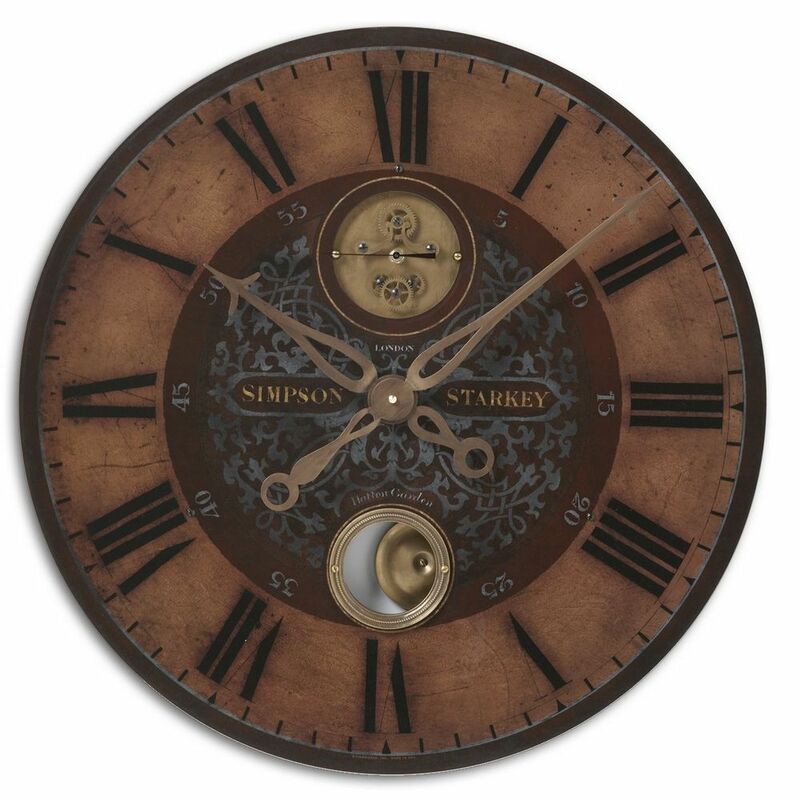 This clock also has a cast brass outer rim and brass center components. 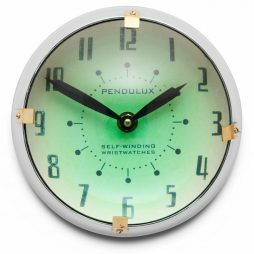 This unique wall clock also has an internal pendulum. 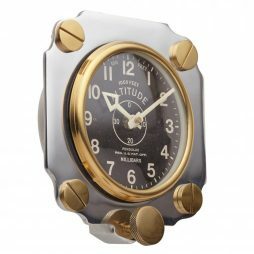 Materials made to craft this stunning timepiece include medium-density fibreboard (MDF),brass, and aluminum. 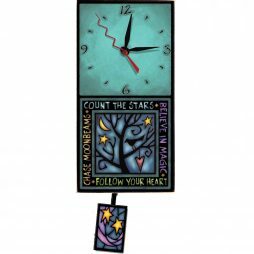 This wall clock is eye catching and beautifully crafted. 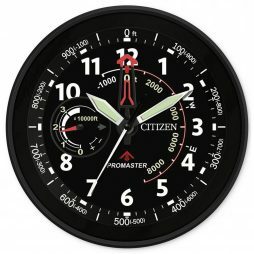 It’s a stunning timepiece you will love to have on your walls. Everyone gets tired of their home decor after a certain period of time. Maybe your old furnishings don’t match up to your ideal living space anymore. 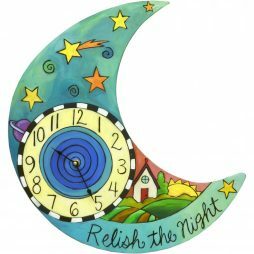 Perhaps you need to find something more suitable to meet the standards of your ‘feng shui.’ Or you could be starting a whole new chapter of your life in a new home of your very own. You could just simply want a fresh start. Whatever the reason, it’s always necessary to do a bit of ‘spring cleaning’ throughout your home. And when you’re trying to find essential pieces that make your home feel like your own, you want to start with a wide collection to choose from. 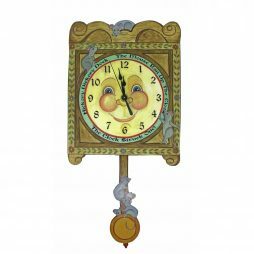 Thankfully, we here at ClockShops.com understand the need for redecorating. 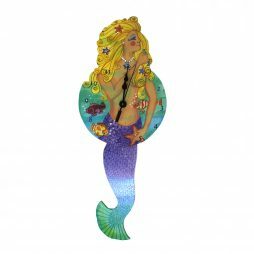 For this reason, we have a large inventory of beautifully-crafted, expertly-designed decorative wall clocks at your disposal. We know a little something about clocks. But we’ll leave the decorating to you. So, do you need a statement piece to fill the hole on that empty wall? Are you looking for a special accessory to tie the rest of a room’s decor together? 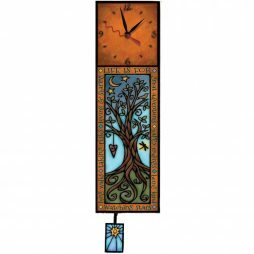 Expressions of Time can solve all of your home furnishing problems with the help of decorative wall clocks. 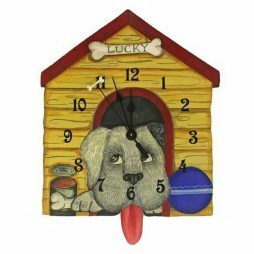 A decorative wall clock can give a room character and sophistication. Or it can add a bit of spice or frivolity. It all depends on the vision you have for your home. 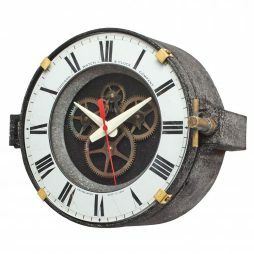 With the help of ClockShops.com, you can add that little bit of creative touch that was previously missing. 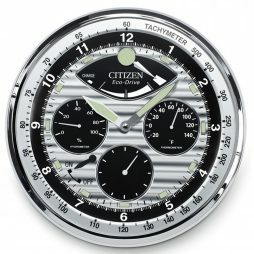 Find that one essential timepiece to truly make your home a work of art. 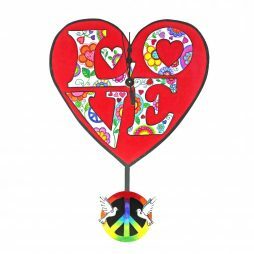 Whether you want a traditional, circular frame, a modern, rectangular shape, or a fully abstract design, look no further than the vast collection of wall decor we have in stock. 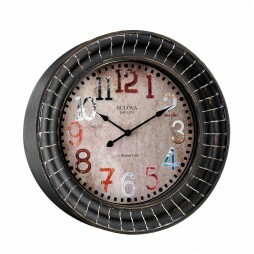 For something with a round shape to offset a room with too many sharp angles, try the Spokes Aged Wall Clock. This decorative wall clock comes as a near-perfect replica of a bicycle wheel, with a bit of nuance for added sophistication. 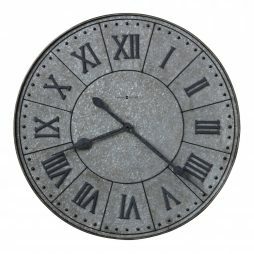 Or go with the Oleshia 23 ½” Decorative Wall Clock, with an aged, antique finish that gives a room character. 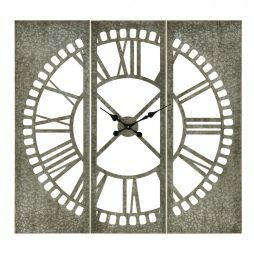 However, if you want something squared with sharper edges to bring structure to your current setting, look into the Rue de Paris Square Wall Clock. 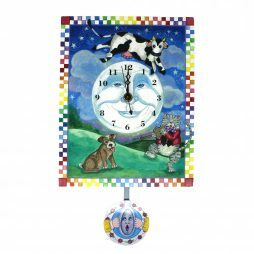 The Herschel 24” Square Wall Clock has some extra flavor to it, with a multitude of colors and stacked numbers to really stand out in a space. 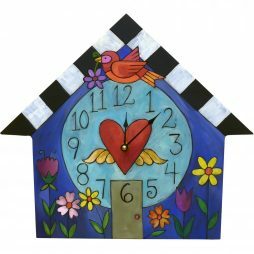 We even offer some fairly abstract patterns and frames in our inventory, like the Lindsey 23 ½” Decorative Wall Clock with its flower-patterned dark frame. 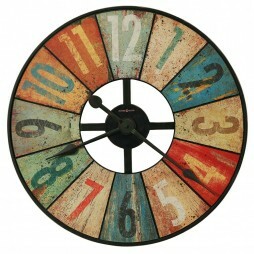 Or go for the extreme with the Wood Ship Wheel Clock, a replica suitable for any nautical theme. Incorporating color into your wall decor can be tricky. After all, you don’t want to overwhelm a space and make it too gaudy. But throwing in a few select pieces that tie-in with the rest of your furnishings can give a space its own expressive flair. Red is the color of energy and passion, making it great for the social areas of the house. 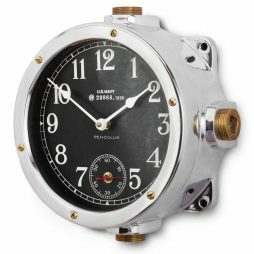 Spruce up your living room with the Howard Miller BrassWorks II Wall Clock. 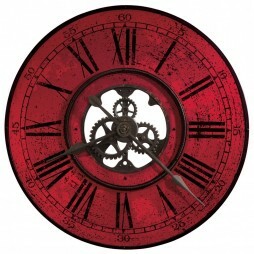 It’s deep red hue will make it stand out above anything else, and its dial has iron gears that embellish it even more. For less intensity, grab the S.B. 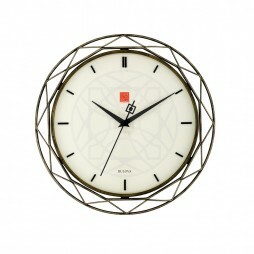 Cheiron 23” Wall Clock with muted reds around its circular shape. 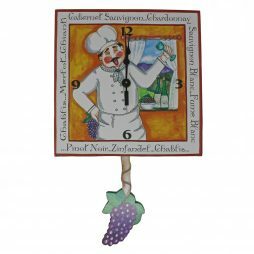 The color of a ripe Washington apple, this decorative wall clock will enhance the room without taking it over. Most shades of blue are known to be soothing. Blue can create a calming effect more suitable for resting spaces, such as the bedroom or bathroom. 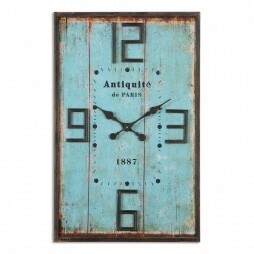 Find something like the Canal St. Martin Square Wall Clock that blends both romantic charm and a sea blue color to create a lovely, decorative wall clock. 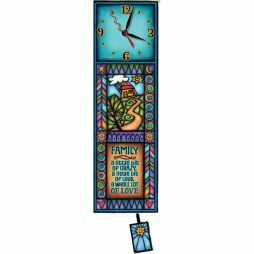 For a great pop of blue color, try out the Howard Miller Harmon 26 ¼” Decorative Wall Clock. 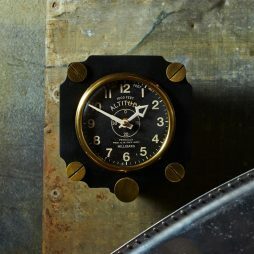 The dial shines in a cobalt blue shade, surrounded by black accents and wrought iron framing that only enhance its hue. 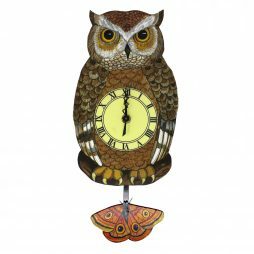 Or go all out with a multitude of colors with something like the Howard Miller Grange Hall 27 ½” Decorative Wall Clock. It has a rainbow of color to brighten up any dull and lifeless space. Modern decor has taken a step back from the dramatics and settled into more simplistic, natural undertones. Wood, granite/marble, glass, metallics; these raw materials are combined with more neutral colors to blend into a contemporary style we know (and many love) today. 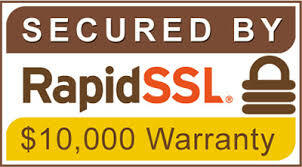 Thankfully, Expressions of Time understands our customers and the ever-changing market. Therefore, we have plenty of decorative wall clocks that fit this mold. 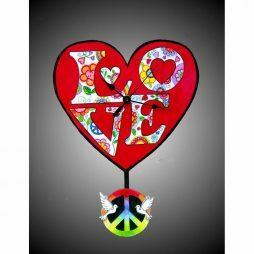 Get ready to accentuate your home with stunning wall decor perfect for a modern lifestyle. Bring the outdoors in with wall decor that screams unrefined, yet still classy. 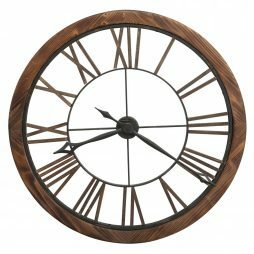 The Mahdis 35 ½” Wall Clock looks as simple as driftwood fashioned into a timepiece. It may seem too basic to some, but this realistic and unprocessed approach to design really does make a lovely, modern statement. 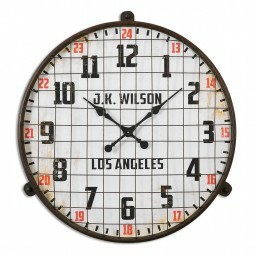 Or take a look at the Uttermost Harrington 36” Wooden Wall Clock. 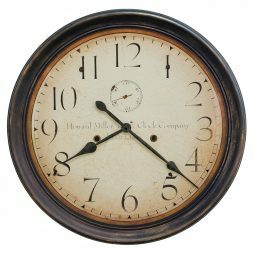 This oversized wall decor has an antique-ivory finish and distressed Roman Numerals, giving it a vintage charm that’s still relevant in a modern home. 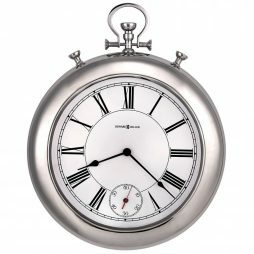 Or indulge in some metallics with the Cooper Classics Senna Large Wall Clock. 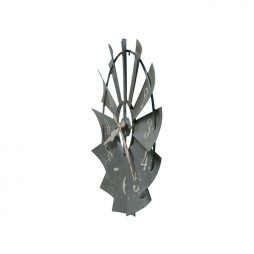 Made entirely of metal construction, this beautifully-crafted and highly decorative wall clock refuses to be unseen. Don’t waste your time and energy searching elsewhere. 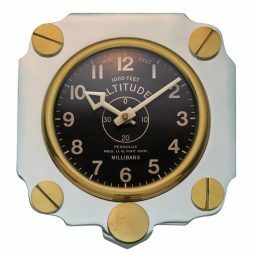 Shop at ClockShops.com and find a plethora of decorative wall clocks to suit your interests. Our reputable brands and affordable prices ensure happy customers – and we’d love for you to figure that out for yourself.